The Williams Environmental Council works to make the campus and student body more environmentally friendly and conscious through events and campaigns targeting specific environmental issues we’re facing as a community. Particular problems that have been addressed include waste from campus social functions, consumer waste, and tree cover on campus. We love hearing from students, staff, faculty, and community members so that we can more effectively work towards greater change. 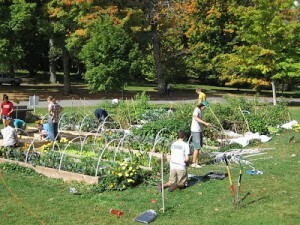 The Williams Sustainable Growers plans and manages the two gardens on campus and distributes the harvest among students. The group also aims to promote awareness of and access to sustainable food and agriculture. We host events and have weekly work parties in the garden open to anyone! The PBC is a student run organization that intends to provide bicycle maintenance services to Williams students and the greater Williams community, while educating people on the processes used to repair the bike. PBC mechanics will teach bicycle riders simple maintenance techniques and try to give riders the skills to fix and maintain their own bikes. The PBC will replace simple parts and perform the maintenance free of charge. The PBC will conduct a free bike rental program for students, staff, and faculty. The PBC, affiliated with the Center for Environmental Studies, looks to improve the quality of cycling on the Williams campus by providing safety and riding tips. Moo-Mami teaches members of the community useful cooking techniques and immerses them in the process of sharing that food. Organization participants will learn and become comfortable with a variety of cooking techniques, thereby acquiring a valuable life skill that students ordinarily are not exposed to in the academic classroom. Through the culinary lessons and time allotted to practice, we hope to build and foster a sense of community around food. Williams Beekeepers provides educational meetings for the public, as well as real apiary experience at Williams’ local beehives for members, ultimately allowing members to harvest their own honey. WRAPS packages leftover dining hall food into individual meals made up of a grain, protein, and vegetable. We freeze these meals before delivering them on Fridays to our community partners in North Adams. The Campus Kitchen at Williams College is a student run food redistribution program committed to reducing waste and alleviating hunger. The purpose of Kinetic is to cultivate a social innovation incubator committed to designing and implementing creative, non-political, sustainable, scalable solutions to pressing social issues in the Berkshire region. Kinetic teams, which are comprised of 4-8 Kinetic members, work on a particular issue in three distinct phases: research, design, and implementation. Kinetic members work to understand the entire landscape of an issue and to discover gaps where they can intervene and create systemic change. The group calls on Williams College Trustees to screen out all future investments in the top 200 fossil-fuel companies, within five years, divest the endowment of all direct and indirect investments in these same companies, and reinvest in opportunities that will reduce the college’s reliance on fossil fuels and companies that will enact solutions for climate change mitigation and adaptation. They work closely with The Williams Endowment Initiative, a group of alumni with the same goal. For more information about and a list of student organizations, visit the Office of Student Life website.